Part of why I was excited to release last week’s announcement was that I can finally talk about the different pieces of my latest project, and how everything is coming along with them! This includes the maps of Halarite for the Sword of Dragons novels! A couple of years ago, Wayne Adams of VtW Productions introduced me to a friend who was interested in making maps for the Sword of Dragons. Through many months of collaboration, Chloe drew up several maps, including a low-detail one of the world and higher-detailed versions of each continent. I have very little experience making or labeling maps. And it is not as easy as one might think. How do you put labels on a map so that it is understandable, legible, and not cluttered or confusing? Thankfully, I had actually done some work on this all the way back in school, and a little bit since then. Plus, I love maps. 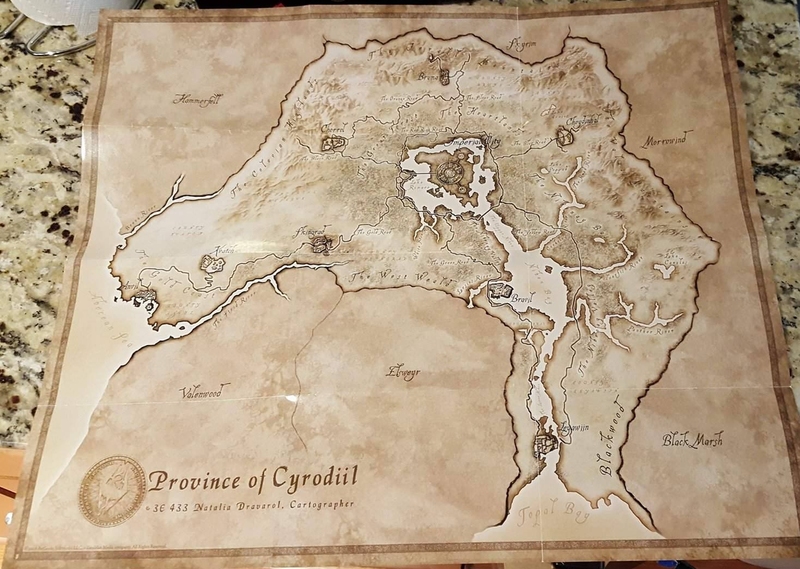 I have a giant map of Middle Earth hanging on the wall at our apartment, and I have kept every map from every Elder Scrolls game I’ve bought, not to mention some old maps from EverQuest. Just like a book cover must convey the appropriate message to the target audience, a map should be tailored to convey the information someone might need from it. 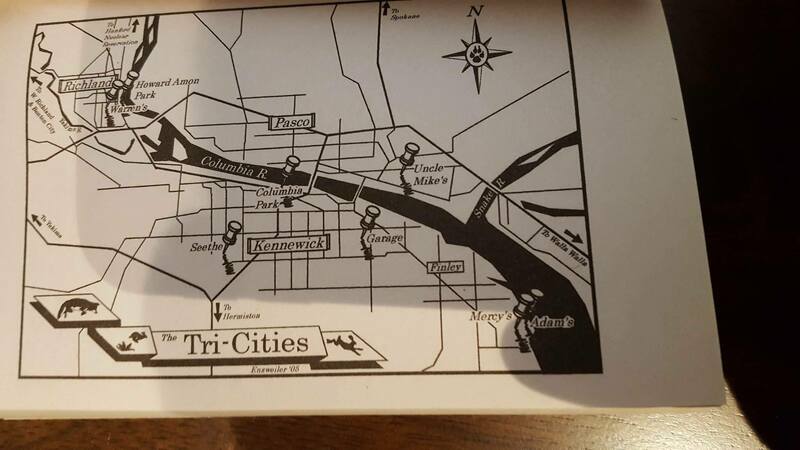 In the case of a novel, a map should have the information a reader might need. These decisions are especially important for me since my maps will be in a small, black-and-white paperback format. That means there isn’t going to be room for a lot of small details, and fine-print will make it impossible to read. Obvious labeling will be necessary. I do have the advantage of the fact that I have different detailed maps. The overall global map has few land features on it, so that gives me room to label political boundaries, for instance. Furthermore, I’m considering having the global map span two pages, as I’ve seen done in other novels. 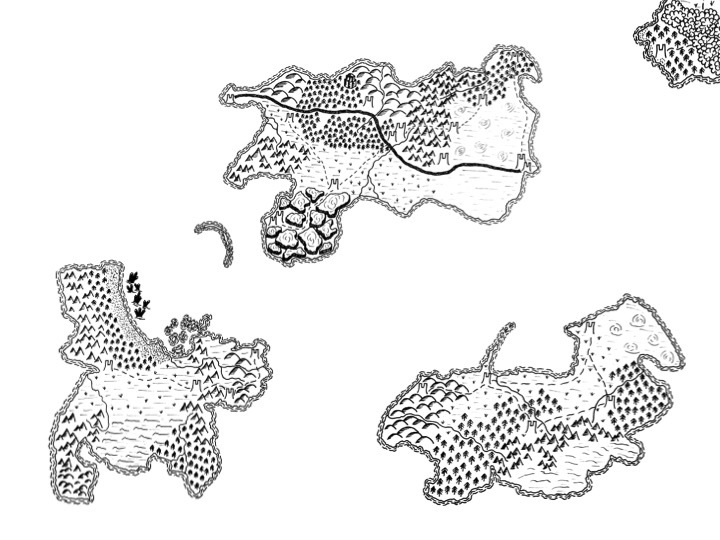 Then, for book 1, I’ll have the more detailed map of Edilas, the continent where the 4 kingdoms are, on a single page. For book 2, I may still include that map, but I’ll also include a map of Devor. Another lesson I remember from school is that bigger features require bigger names. So for instance on the global map, I’ll make the world name the biggest. Continent names will be smaller. Kingdom names smaller, followed by city and feature names. One advantage I do have: these are fairly high-res images. So while I’ll be focusing for now on the maps that’ll go into books 1, 2 and 3, I will be making higher-detailed versions for the website, http://www.theswordofdragons.com/. Thankfully people can always zoom in to read finer print on the web. There’s also the advantage of color on the web. I’ve already played around a bit by adding overlay colors for the 4 kingdoms on the global map. I think this will be useful and interesting for readers. While I don’t want to make readers of the print editions go online to see more detailed maps, I think having the option will be a nice addition. “Here’s these maps, but if you want to see more details, go to the website!” That’ll allow readers like me, who love to learn as much as possible about fantasy worlds, to get more information. That’s all for today! I hope you’ve enjoyed this glimpse into the production of the 2nd editions. If there are any specific features you’d like included in the maps, let me know in the comments! I think it’s great that you’ll have the maps in the books but then more detail available online. I’m one of those people who would love looking at more detailed maps :) I’ve struggled with book maps several times, either unable to read them or not enough detail. Thanks for sharing your update! Some books have great maps, some have horrible. I’m hoping to avoid being in the latter lol. But they are fun to explore!